Some of us in Seattle Cosmic have been working on a game construction project, and we are thinking of selling it through Tim Schutz's game company, tjgames.com. 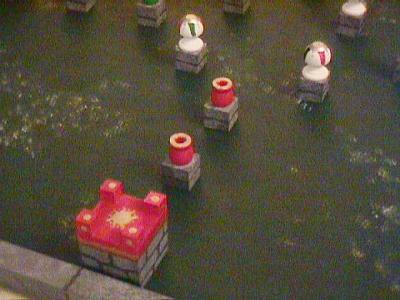 The game is called Castle Croquetnole, and rules for it are freely available. 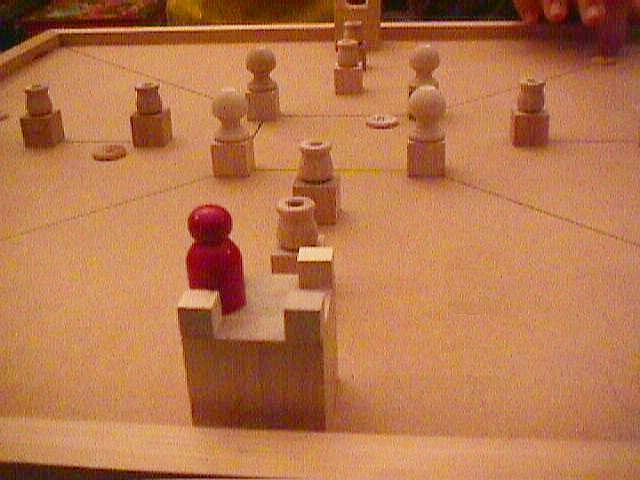 It was originally designed as a flicking game for the piecepack, and was meant to be a cross between Lewis Carroll's Victorian lawn game Castle Croquet and the popular tabletop game Crokinole. 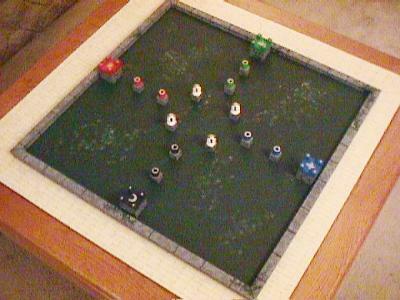 It was largely sparked by the innovative piecepack game TabletopCroquet, which simulates standard croquet. 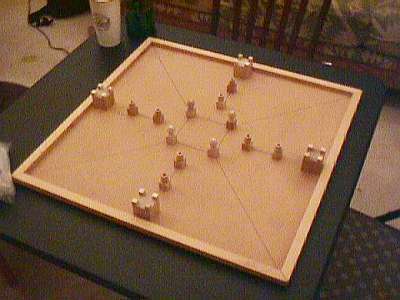 In October 2002, Tim Schutz presented me with an unfinished custom board he made for the game. We tried the board out with some piecepack coins that very night. You can read the account of how the board played -- quite nicely, we thought. Over the 2002-3 holidays, Marty Hale-Evans painted the board. 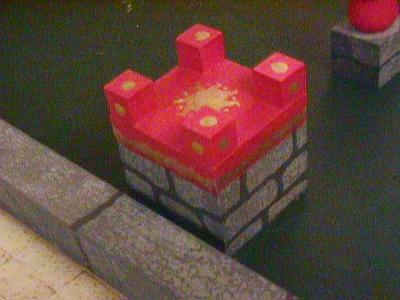 The resulting product has an appropriate Alice-in-Wonderlandish feel, with fanciful "castle towers" painted with piecepack suits, set against a broad green field painted with flowers, all surrounded by a "stone wall". We have yet to spray the board with sealer and wax the playing surface for better flickability. We'll let you know how this work in progress turns out. Note that we are thinking of selling plans, kits, and finished boards, so you will be able to choose your level of involvement and how much you want to spend on it.